Oranges are packed with vitamin C and full of flavour. Blood oranges are marbled with a deep red colour and are guaranteed to make any dish look stunning. Semifreddo refers to a dessert which is partially frozen and this healthy but indulgent recipe needs hardly any preparation and is ideal for serving after the recipe for Chicken with Wild Mushroom and Champagne Sauce. Using a serrated knife, cut a small slice off the top and bottom of each orange, to expose the flesh. Segment each orange by cutting down from top to bottom between the peel and the flesh, removing all the pith and peel. Chop the flesh from the oranges into bite-sized pieces. Spread the pieces of orange on a large freezerproof tray or plate and transfer to the freezer with the yogurt (still in its plastic container) for 1 hour, until firm. Toast the almonds by heating a dry frying pan until hot. Add the almonds and toss regularly until golden and toasted. Remove from the pan and set aside. When the oranges are firm, transfer to a food processor with the yogurt, icing sugar and cinnamon. Blend until just roughly combined. Scoop into bowls and sprinkle over the almonds before serving. Blend the yogurt and almonds together for just few seconds to give a good chunky semi-frozen texture. If you process the mixture for too long, it will become a runny purée. 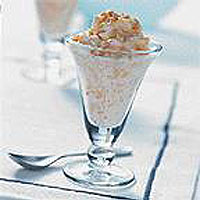 Prepare the oranges and place in the freezer along with the yogurt the night before you want to make the dessert.